Yet another Onam has arrived! Kerala is in full force celebrating this harvest festival. Onam is celebrated in the month of Chingam, which happens to be the first month in the Malayalam Calender. Onam is historically considered to be a festival when the mythical ruler of Kerala, Mahabali, returns to the land on an annual visit of his old subjects. All Keralites celebrate onam irrespective of their caste or religion, with equal spirit. Every household would have floral design made near the door step to welcome the mythical ruler to their home. Lunch is usually marked with a sumptuous meal, punctuated with a variety of dishes suiting every taste - from sweet to sour to spicy. I have written about Onam many times in the past, and would not like to repeat the same. Onam is celebrated to mark the Harvest season, and also to welcome the mythical king Mahabali is regarded as the best ruler the state has ever seen. History has it that Mahabali was an Asura (or Devil) and he ruled over all the three worlds, including the Devas. Annoyed by this, the Devas approached Lord Vishnu for help. It is said that Lord Vishnu approached Mahabali in his Vamana avatar. Mahabali was performing a Yagna at that time, and he had promised to fulfill the needs of any one approaching him. Taking advantage of the situation, Vamana said to Mahabali, "You need not give me anything great. It is enough if you give me that extend of land covered by three footsteps of mine". Although Mahabali was warned by the sages performing the Yagna that Vamana was an avatar of a Deva and the statement was a trap. Mahabali, determined to keep up his promise, begged pardon from his Guru (among the sages) and disregarded his advice. On hearing this, Vamana grew in size until he towered above the heavens. He measured all of the earth with one Footstep. The second claimed all of heaven. With one more foot of territory still remaining, Mahabali requested Vamana to place the final step on his head as the third step of land, since had no other territory left. Vamana did so and in doing so, pushed Mahabali down to Patala, the underworld. As a parting blessing, Lord Vishnu allowed Mahabali to rule over the underworld, and also visit his subjects once every year. Anecdotal evidences show that Onam was celebrated in as early as 800 AD. 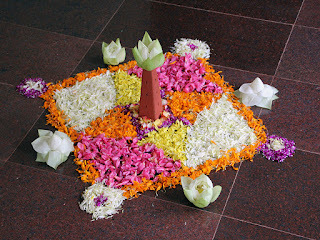 Onam is celebrated in the malayalam month of Chingam. Coincidentally, the Malayalam calender also starts with the month Chingam. Onam falls on the tenth day from the day, the star Atham is marked. Happy Onam to all Keralites!! !